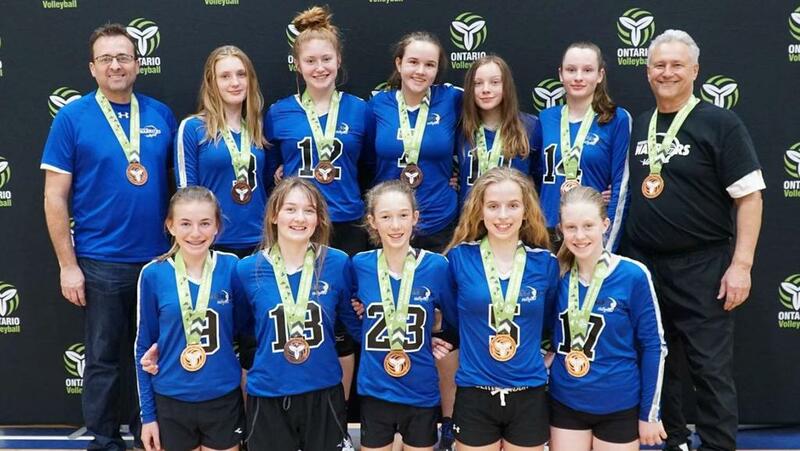 Warriors 14U win Bronze at Ontario Championships! After winning Trillium Gold the Warriors moved up to Championship Division and won Bronze losing the semi to Forest City Green. 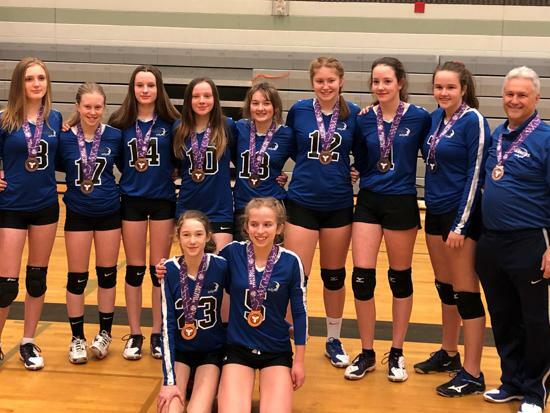 In the 4th and final 14U OVA tournament the Warriors were really firing on all cylinders and did not drop a set on their way to a Championship Division Gold Medal. 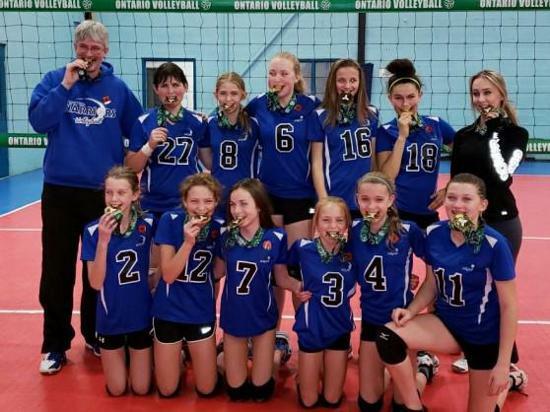 The Ontario Championships saw the Warriors playing higher ranked teams than they had all year and losing all 6 sets on day one. Day 2 Warriors were moved down Tier II of Division II and won all 6 sets and were starting to improve again! The final day had a nervous Warriors back into Tier I playing Venom Vipers (Richmond Hill) which had punished the Warriors 2 straight on Friday the first set a very lop sided beating of the Warriors 25-9. Sunday it was a better adjusted (to the level) Warriors that went on to win a tough fight in 3 sets 25-19, 21-25, 15-7 to move to the quarter finals. The Warriors now rolling went on to beat Durham Rebels Extreme 25-15, 25-14 to move the semi finals. The Warriors lost in the semi's to Etobicoke Titans 25-21, 25-21 to now play for Bronze. Warriors after coming this far were determined to to have their 4th Medal in a row and send a clear message they had risen to the top of Division II and went on to beat 2nd seed Defensa 25-13, 25-9 to win Bronze! Congratulations Warriors 14U. Woodstock Warriors 14U finishes off 15U season with Bronze Medal! 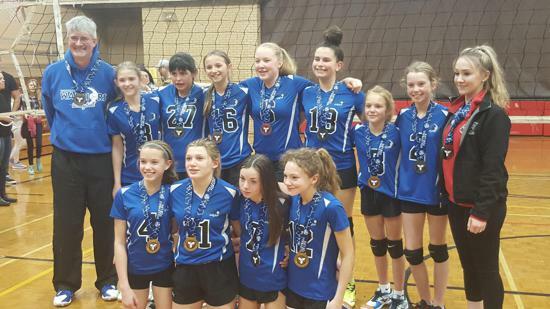 The Woodstock Warriors 14U won their 5th medal in 8 OVA tournaments to end the season. The Warriors lost in the semi finals to Milton in two straight before beating MVC (Hamilton) 26-24, 25-22 for Bronze. Woodstock Warriors 14U win Gold in Championship Division! The Woodstock Warriors 14U have moved up the rankings fast since the start of the year going Gold, Bronze and Gold in last three tournaments! 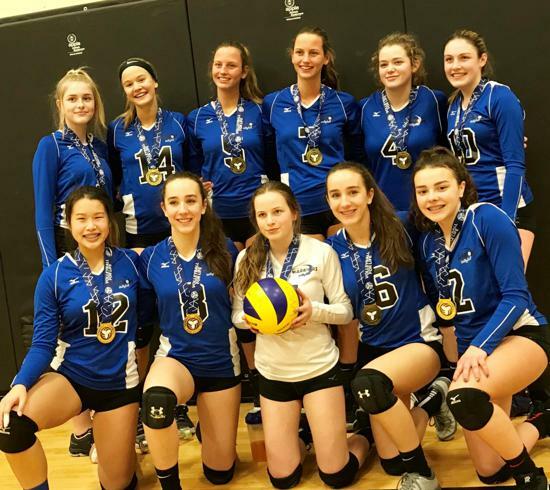 The Championship Gold medal finishes off the season before the Ontario Championships was done without losing a single set! 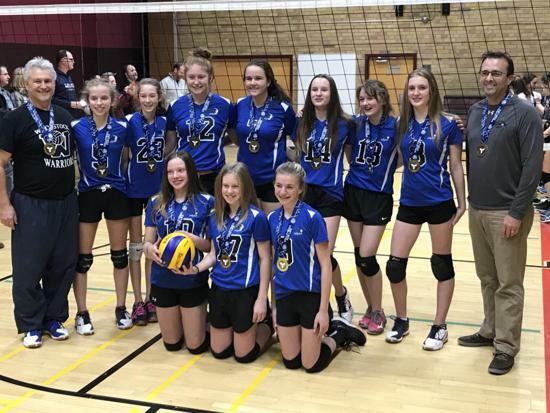 Woodstock defeated Stratford Stingers in the finals 25-17, 25-23. Woodstock will go into the Ontario Championships ranked 39th (7th in Division II of IV) in the 171 team 14U division! Woodstock Warriors win 14U Championship Bronze! Woodstock Warriors 16U win Gold to qualify for Premier! The Woodstock Warriors 16U went into the Challenge Cup Select Division (2nd highest) seeded 9th out of 9! The Warriors never let that bother them! After winning a very close intense quarter final over Markham Revolution 17-25, 25-18, 16-14 (Markham's coach Lennard Krapp also coaches the #1 FIVB Women's beach team in the world Canadians Wilkerson and Bansley) Markham had some tricky stuff for the Warriors to endure! The Warriors prevailed the close quarter final and went on to straight set wins over MVC (Hamilton) 25-20 and KW Preds from Kitchener 25-18, 25-12 to win Gold and qualify for Premier Division! Premier is the top 9 teams in Ontario out of 170 teams! Woodstock Warriors 13U win Silver in 14U Trillium tournament last weekend! 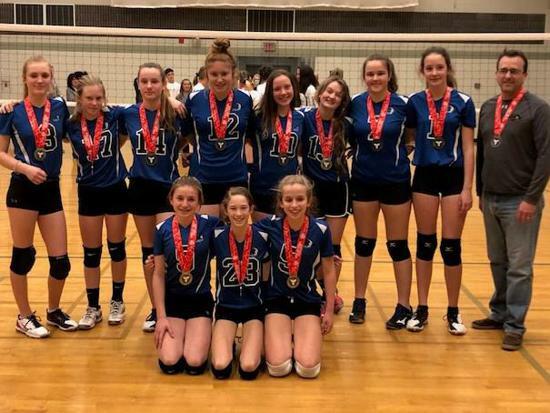 The Woodstock Warriors 13U girls only lost one match and that was in the finals to Forest Green 14U in 3 sets of the 14U Trillium tournament in Kitchener on Saturday. Way to go Warriors 13U! Woodstock Warriors 14U win Gold in Chatham! 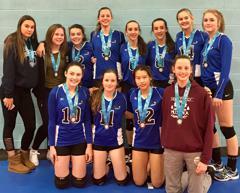 The Woodstock Warriors girls 14U team won every match in Chatham last weekend only losing one set on their way to Gold. This win will move the Warriors up to Championship Division for the next 14U tournament! Woodstock Warriors 13U win Gold in first tournament of the year!!! 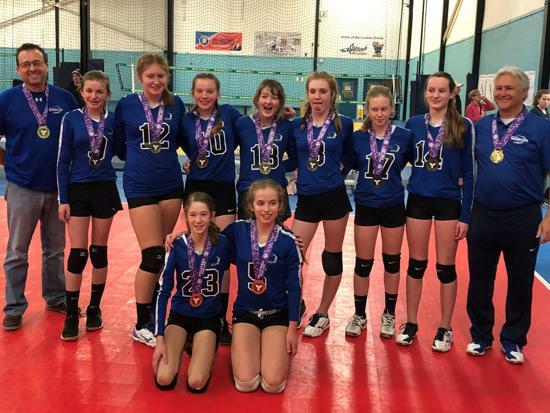 The Warriors 13U won all 5 matches last Saturday and only lost one set which was in the Gold Medal game! This win puts Woodstock in the newly created Premier Division the highest division in Ontario! The top 9 teams out of 85 teams at 13U are in Premier! 2019 Winter Youth House League will start Jan 18th! If you are interested in officiating Adult League, High School and Elementary volleyball please contact Jody. The two Woodstock Warriors who were members of the Region 3 Black (Ally Gibson) and Region 3 Red (Abby Springham) both come home with medals! Region 3 Black won Silver and Region 3 Red won Bronze! Woodstock Warriors 15U win Ontario Championship Division II 16U! Woodstock Warriors 15U entered the 16U Ontario Championships Division II (of IV) ranked 15th out of 32 teams and come out with a Gold! 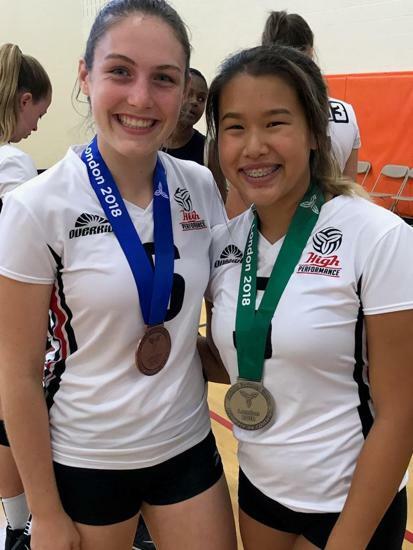 The Woodstock Warriors 15U went 1-2 on the first day of Ontario Championships, 3-0 on the second day and the required 4-0 on the final day to win Gold. On the final day the Warriors defeated the #2 seed Hamilton Smash in 3 sets the quarter finals. (Woodstock lost to Smash in pool play) Then Woodstock defeated Forest City Blue 16U and in the semi's and #1 seed Chatham Ballhawks in 3 sets in the finals to win Gold! Woodstock Volleyball club AGM will be June 26th at 6:30 pm at Cowan Park in the board room. 3 Woodstock Warriors chosen for the Region 3 Team for the 2018 Ontario Summer Games!!! Woodstock Warriors Ally Gibson #12 and #10 Abby Springham have been chosen to the Region 3 Team (which is from Windsor to Mississauga) and #2 Monica Henry was chosen as an alternate! 2018 Ontario Summer Games will be held this year in London and the opening ceremonies will be at TD stadium on Aug 2nd. The volleyball will be played at University of Western Ontario. 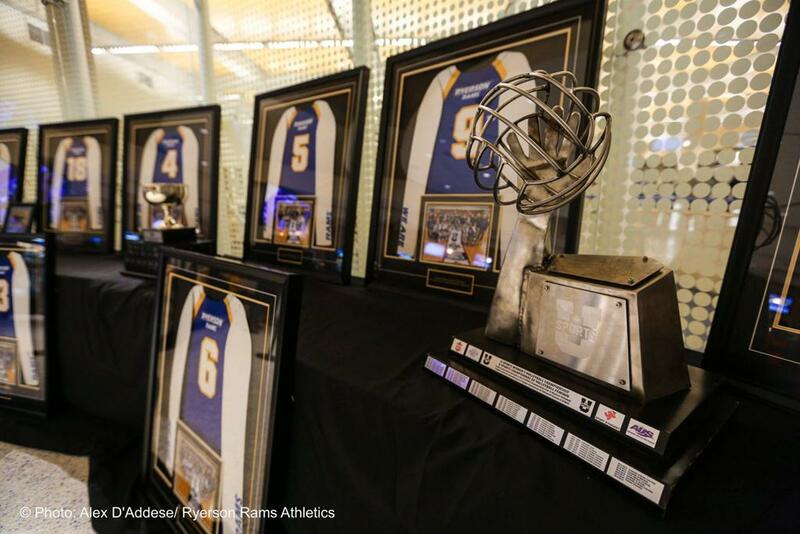 Ryerson Rams complete the perfect season going 25-0! 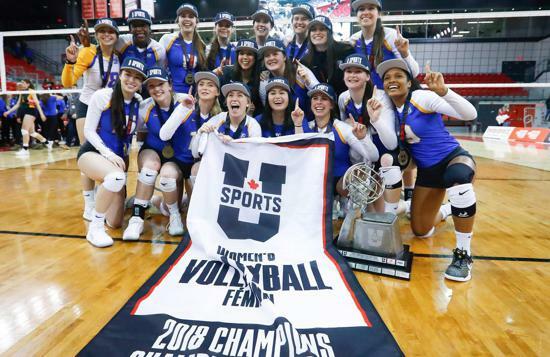 Ryerson Rams defeat UBCO in 5 sets to win National Quarter Finals and #1 ranked Calgary Dino's in the National Semi Finals and University of Alberta in the Finals both in 4 sets to win the first National Championship of any sport in Ryerson history!!! 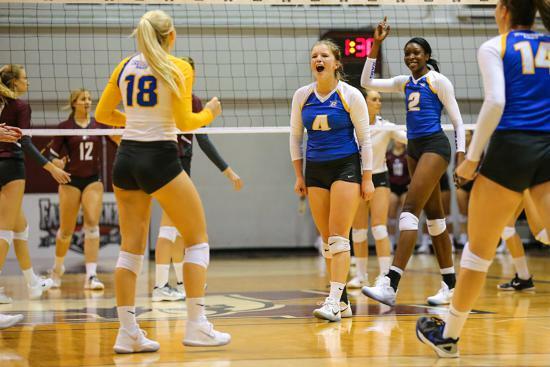 Former Woodstock Warrior Madyson Timpany (#12 on the left of our website) is on Ryerson Rams and coach for the past two summers at Warriors Summer camp Janelle Albert. Janelle Albert was Rams player of the game in the pivotal comeback against UBCO in the quarter finals being down 2 sets to 0! 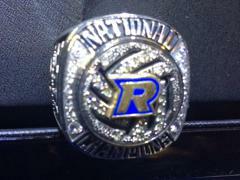 Ryerson went 25-0 this season! Ryerson goes 22-0 to win OUA's! The 2017-18 Ryerson season started off being down 2-0 to the defending OUA Champions McMaster Marauders and Ryerson coming back to win the next 3! 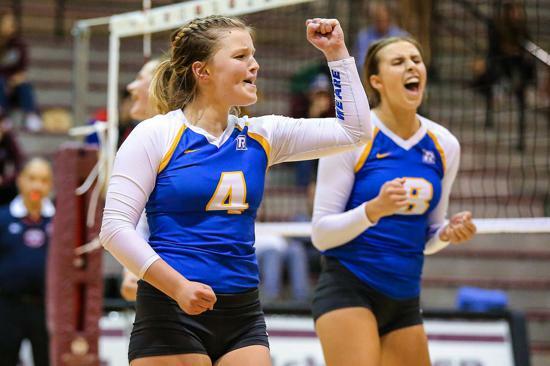 Fist pump is from Ryerson setter (former Woodstock Warrior) Mady Timpany. Ryerson would go on to win the next 21 matches to have a 22-0 season! Rams claim first ever Quigley Cup championship! 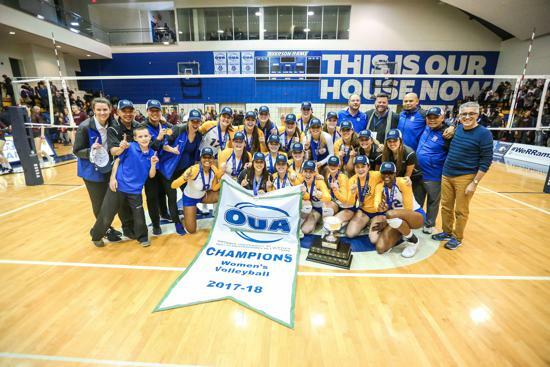 The Ryerson Rams claimed their first ever OUA volleyball championship on Saturday night, defeating the McMaster Marauders 3-1 in front of a packed house at the Mattamy Athletic Centre. Former Woodstock Warrior Mady Timpany plays for Ryerson Rams and Janelle Albert who coaches at Warriors Summer Camps is also on Rams! Registration for Winter Youth House League FULL! We are on a waiting list only basis. Do contact me if interested we are trying to get some more in but is getting very hard! Warriors 15U qualifies for Premier highest division in Ontario! 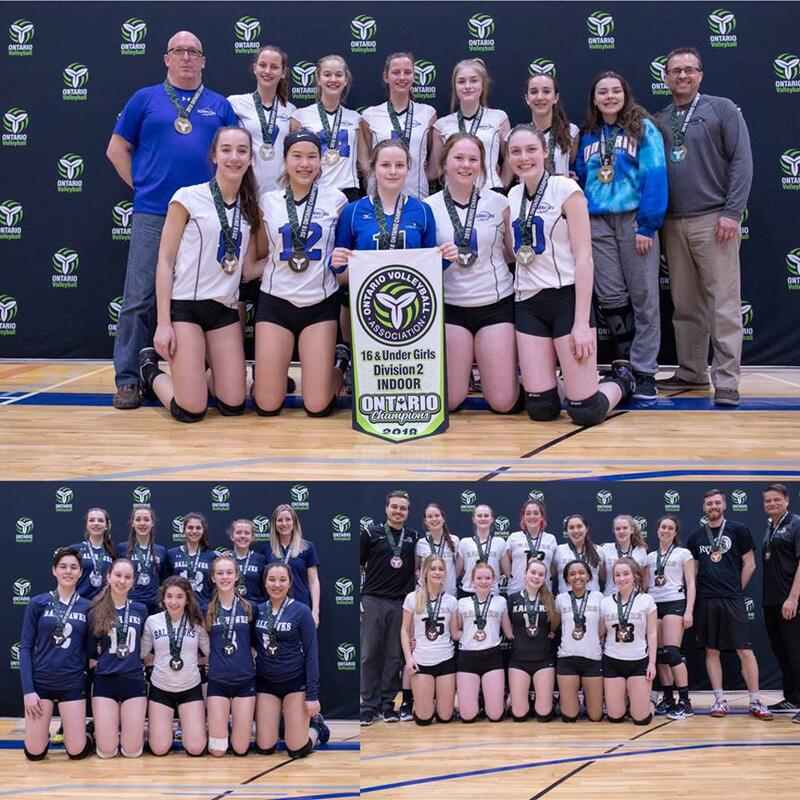 Warriors won all of their matches except the final in which they lost in 3 sets to KW Preds 14U team which is the defending Ontario Champions at their age. January 27th the Warriors will be at the University of Ottawa. The 15U Warriors will represent Woodstock against the finest 8 other top teams in Ontario at 15U! If you or anyone you know is interested in becoming an official please let me know. There is Adult games at night and High School games during the day. Woodstock Warriors 15U official season to open Nov 11th! The Woodstock Warriors 15U girls team will have their first tournament of the year at Conestoga College on Nov 11th. The Warriors will start in the Select Division which is the top 9 teams in the West of Ontario. There is 9 team Select in the East as well and these 18 teams are the highest ranked teams in Ontario out of 139 teams competing at 15U! So it will be some VERY good competition! The Warriors 15U will welcome back 7 returning athletes from last year Ally Gibson, Ashley Docherty, Bree Allard, Eden Wright, Ainsley Docherty, Monica Henry and Haley Cocker. Warriors will welcome 5 new Warriors Abby Springham, Dominique Gudziewski, Lauren Dalueg, Natalie Gudziewski and Ashley Ross. 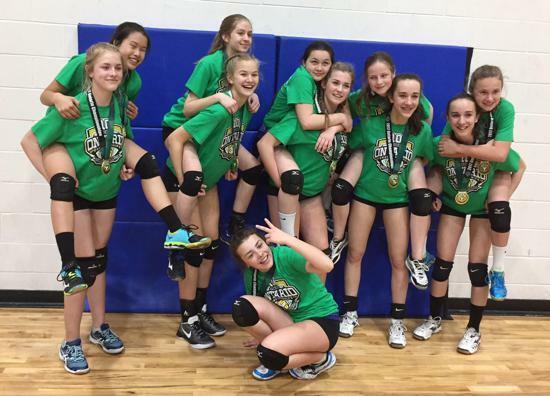 Warriors 13U girls will have their first official OVA tournament ever Nov 11th! 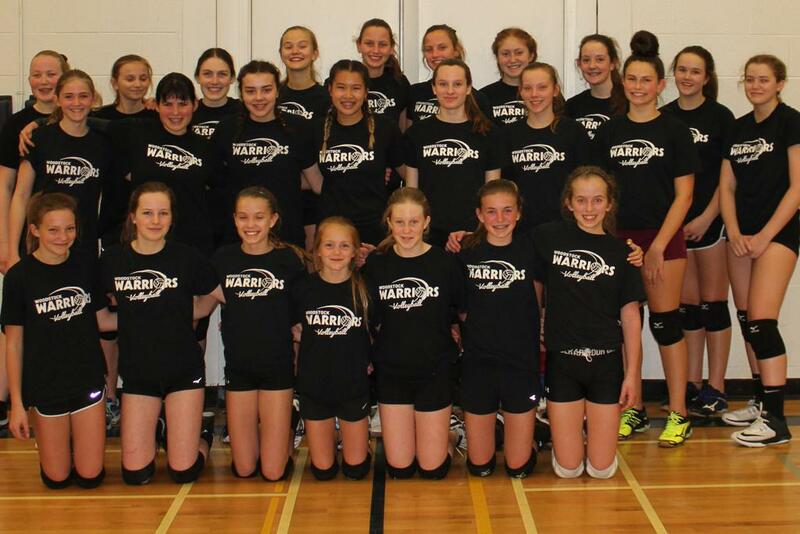 The OVA careers start for the Warriors 13U on Nov 11th at a tournament in Kitchener. Go Warriors go! Ryerson won this contest 3-0 but both girls were part of the same winning team in the Woodstock Adult Summer League this past summer! 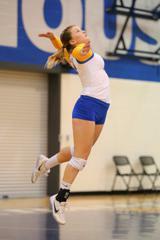 Ryerson setter Mady Timpany fresh off winning Woodstock Adult Summer League was geared up to face McMaster! Woodstock Warriors Win Gold at 15U Ontario Championships! Woodstock Warriors 14U win Tier I Gold in 32 team 15U Div III Ontario Championships. 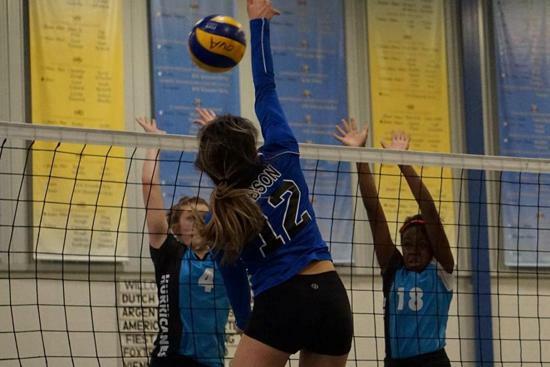 The 15U tournament is a tune up tournament for this weekend's 14U Eastern National Championships in Ottawa. Warriors went 10-0 at 15U Ontario Championships and 8 sets to 0 on the final day! The rapidly improving Woodstock Warriors 14U will enter the 14U Eastern National Championships ranked #11 out of 32 in Division I. Men's University Final of U of A vs. Trinity Western. 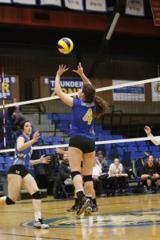 Local content rookie setter Mady Timpany plays after set 1 for Ryerson Rams vs.Dalhousie in Consolation semi. 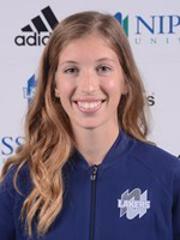 Tracy Hammerton Left side and Captain of Nippissing University was named an OUA 2nd Team All Star. The Woodstock Warrior 13U team from 2007-08 featured girls in their first volleyball game. 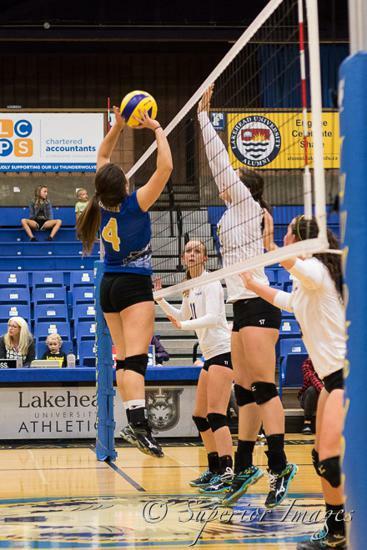 The video starts with (left) Jennifer Hammerton setter for Lakehead University 2nd in OUA assists. 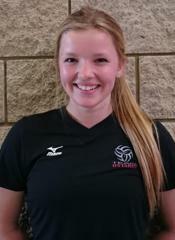 Followed by Amanda Kuiper Mohawk College setter/right side and OCAA All Rookie team. 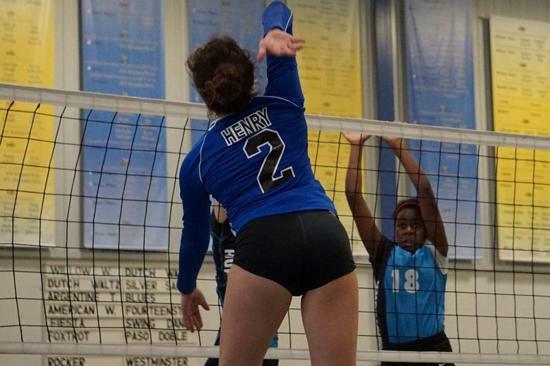 Then Mady Timpany Rookie setter for Ryerson University. On that same Warriors team was Jordan Lake St. Mary's University Halifax (OVA All Star) and Tracy Hammerton Captain Nippissing University and this year OUA 2nd Team All Star. OUA Final Four has some local content! 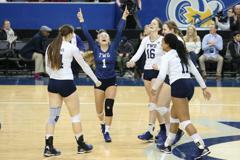 Rookie setter and former Woodstock Warrior Mady Timpany did play against U of T in the 3rd set of the Bronze Medal game. U of T was ranked #1 in Canada going into The Final Four. 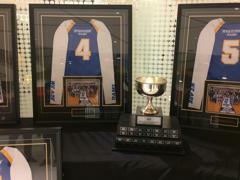 The National Championships are at Maple Leaf Gardens this weekend hosted by Ryerson. 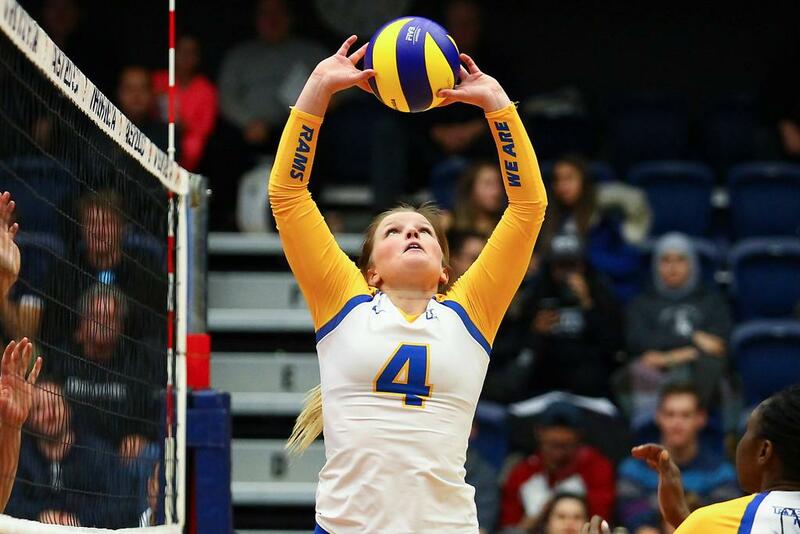 Ryerson plays on Friday vs. University of Alberta at 6 pm. 3 Ontario teams to follow in the Championships this weekend. 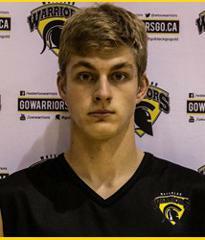 Tracy Hammerton was a Warrior from 13U-17U and was part of the first Woodstock team ever to make Division I Tier I and first Warrior team to play OVA in Premier. Tracy is currently studying Nursing and is in her 4th year at Nippissing University. Tracy currently leads the Nippissing Lakers in Kills at 122, Kills per set and Service Aces, Service Aces per set plus total points. As a two way player leads the team in digs, digs per set plus total points. Tracy is also top ten in the OUA in each of Kills, Kills Per Set and Total Points! Tracy is 11th in OUA in digs and 11th in Digs Per Set. Alix Christie signs with NCAA Div I University of Louisiana Monroe! Alix is the first former Warrior to sign with an NCAA Div I team! Alix was part of the 2012 Woodstock Warrior team that went to the Ontario and National Finals in Toronto and 2013 National Tier II Silver Medalist. Alix was a Warrior until 17U and still coaches at Summer Camp. Alix played her 17U year at Defensa this year her 18U year at Halton Hurricanes. Former Woodstock Warrior Lakehead Athlete of the Month! As an added bonus Jenn is 9th in the OUA in Service Aces and #1 in Service Aces for setters! Former Woodstock Warrior Mady Timpany plays for 18U Ontario Champion Pakmen Gold! Former Woodstock Warriors part of the 2011 National East and 2012 Ontario and National finalist Woodstock Warriors 14U team. Mady Timpany currently plays for the 18U Ontario Champion Mississauga Pakmen. The 2016 18U girls Pakmen Gold did not lose a match at this years Ontario Championship. The win was a 2-0 win over the Ontario 17U Champion Aurora Storm in the 18U finals. The game was covered by Ontario Volleyball Webcast! Pakmen will go into Nationals as the #1 seed in Canada. Congratulations to the Pakmen 18U Gold! Kuil Schoneveld former Woodstock Warrior, plays for the University of Waterloo Warriors who competed as one of the top 8 University Men's teams at Nationals from Mar 10-12 at McMaster. 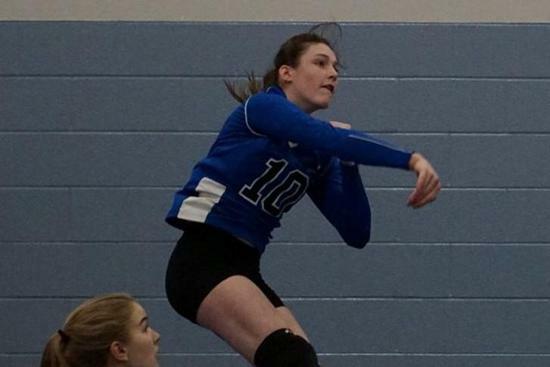 Kuil was part of the LVC National Champions at 17U and also was part of CASS volleyball program. The semi and finals on the last two days were sold out crowds in excess of 2,000 people.